We are glad to present you the ECFanGrid, a new ventilation product. It consists of series of EC-Fans used in parallel and offers a total versatility to suit every facility through a modular design. The resulting air flow is proportional to the number of fans used while the pressure conditions remaining the same. 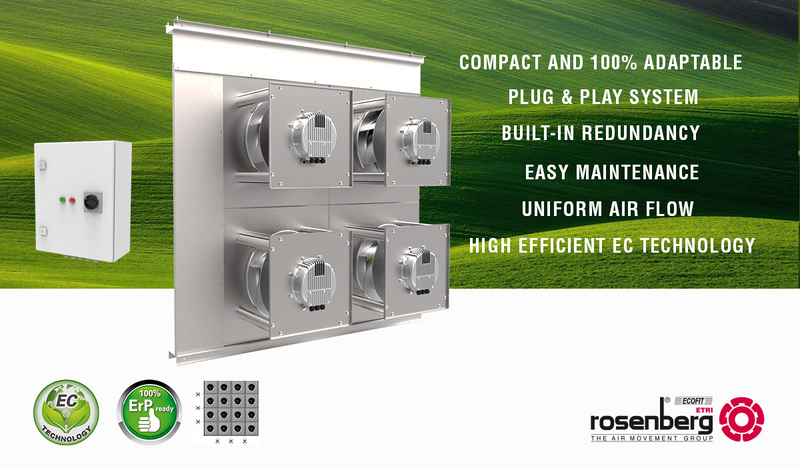 Designed to be added to new Air Handling Units (AHU), in retrofit projects and facility modernization, or retrofit belt or direct driven fans. The new equipment has a high efficiency due to the use of EC-Fans. Moreover it offers an easy way to do the cleaning, maintenance or replacement of any component because of its composition that presents a considerably depth reduction. If a single large fan is removed the energy savings can be up to 50%. The weight reduction is a big advantage to the installer thanks to its composition. Built a new ECFanGrid is a two man job and can be built directly on site, making a lot easier to install the product than a large fan. The redundancy systems offers the advantage if a fan will stop, the systems keeps offering the same operating point by increasing the speed of the remaining fans through integrated air flow and pressure controls. ZEN Decorative Air Curtain "Carmen Thyssen space"